A glimpse at the rich and varied histories associated with Cleveland Heights' numerous houses of worship. Adapted from Marian Morton's newest book, "Discovering Change: Cleveland Heights Congregations," available at local bookstores and through Amazon.com. 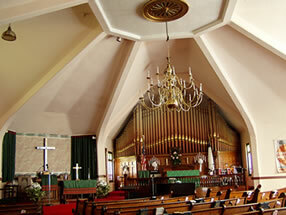 Cleveland Heights Congregations (Arcadia Publishing, 2009) began as a talk in the Superior Road Schoolhouse for the Cleveland Heights Historical Society in fall 2007. The talk in turn began with my realization that, within a ten-minute walk from my house, were four Jewish congregations (one Conservative, two Orthodox, one “Traditional Egalitarian"), a Greek Orthodox cathedral, a Roman Catholic church, a Disciples of Christ church, a Church of Christ, an African Methodist Episcopal church, a non-denominational African American church, a Presbyterian church, and two Lutheran churches. Only two of these existed when my street was laid out almost a century ago. The point of that talk was that these congregations were an interesting illustration of our changing community and the diversity that Cleveland Heights folks like to brag about. A book on religious congregations, however, needed to be far more inclusive than the schoolhouse talk. The list of Cleveland Heights congregations I got from the Community Relations Department at City Hall contained more than 40 names. And this long list was too short, for I discovered that some congregations had been inadvertently omitted and others had been established since the list had been compiled. I tried—certainly unsuccessfully—to include every single congregation in my book. And therein lay the biggest challenge of the project: so many congregations, to which I sent so many letters explaining the book, followed by so many phone calls to pastors, rabbis, congregation members, and especially, congregation secretaries. And so many were generous and helpful. Some shared with me their congregations’ fine histories: Forest Hill Church, Presbyterian; Church of the Saviour; Disciples Christian Church; St. Louis Church; Fairmount Presbyterian Church; and Church of the Master. 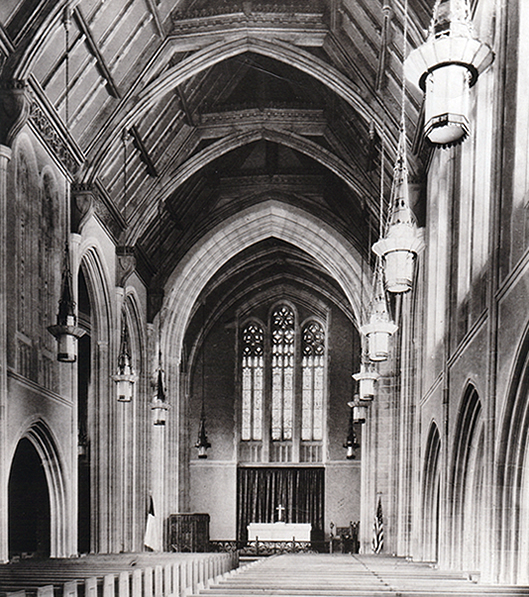 Some lent me wonderful archival photographs from their own rich collections: Park Synagogue, New Spirit Revival Center, St. Paul’s Episcopal Church, St. Louis Church, Sts. Constantine and Helen Greek Orthodox Cathedral, the Church of Christ of Forest Hill, St. Alban Episcopal Church. Some even took photographs especially for me and this book: the First Church of Christ Scientist, Cleveland; Bethel Community Church, and Oheb Zedek-Taylor Road Synagogue. So generous and so helpful were these Protestant, Catholic, Jewish, and non-denominational congregations that I decided to donate my proceeds from this book to the Heights Emergency Food Center. The center was founded in 1981 by the Heights Inter-Faith Council, and it was the best example of Cleveland Heights’ ecumenical spirit that I could think of. An unanticipated benefit of my pursuit of the many religious congregations was that in the course of spring and summer 2008, I got a chance to visit almost every religious structure in Cleveland Heights. This was quite a change for someone who isn’t a regular churchgoer. What I continuously (re)discovered about religious congregations was the important ways they have changed Cleveland Heights, shaping and serving our community for more than a century and a quarter. Most obvious perhaps, religious congregations grew with the suburb and helped it grow. 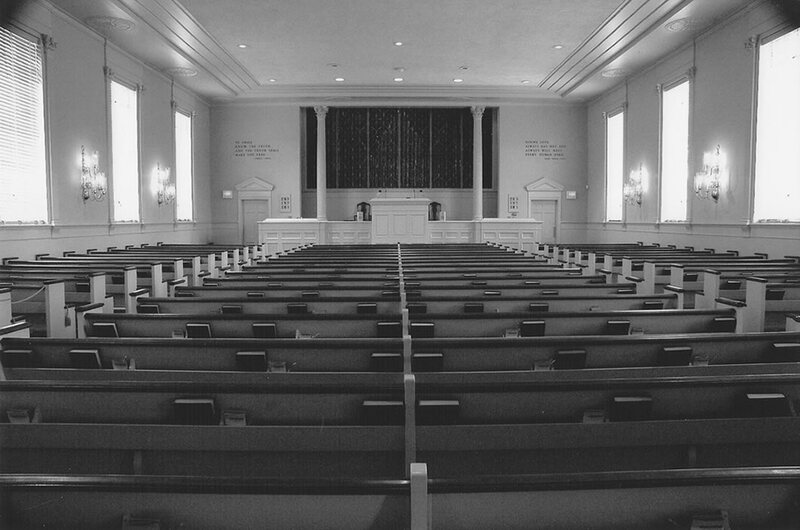 The first congregations established themselves in what was then a rural village , sometimes referred to as “Heathen Heights” or “Heathen Ridge.” The very first church, Fairmount Methodist Episcopal Church (now Church of the Saviour), arrived here in 1875, a quarter of a century before the village of Cleveland Heights itself was established. 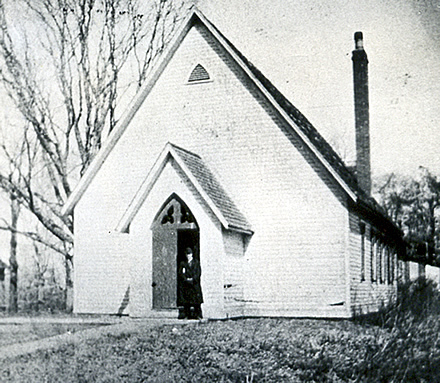 Fairmount Methodist Episcopal Church, c. 1902. The structure was roughly where the Superior Schoolhouse now stands. Cleveland Heights Presbyterian Church (now Forest Hill Church, Presbyterian) followed in 1903, and Noble Road Bible Chapel (now Noble Road Presbyterian Church) in 1907. The founders of these early Protestant churches became the village’s movers and shakers, and their congregations attracted new residents and helped to turn the isolated village into a growing suburb. 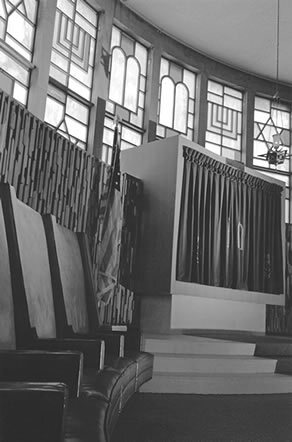 In the same way, during and after World War II, congregations such as Park Synagogue, Taylor Road Synagogue, St. Louis Church, Church of the Master, and the Church of Christ, Forest Hill, led and followed the last significant migration out of Cleveland into Cleveland Heights, helping to swell Cleveland Heights’ population to 61,000. A religious building boom accompanied this population boom. 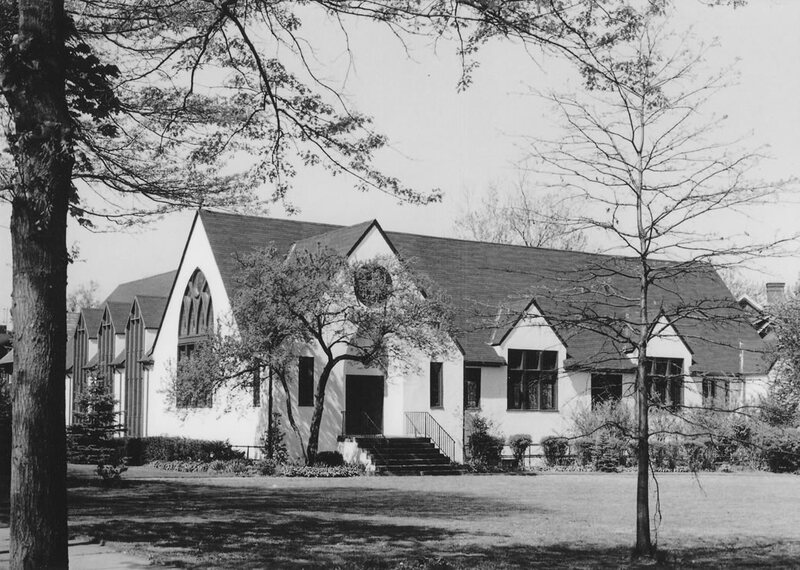 Older congregations like Forest Hill Church Presbyterian and Noble Road Presbyterian built new structures or like B’nai Jeshurun-Temple on the Heights added to the old. Cleveland Heights developers realized early on that religious congregations attracted buyers, establishing the close connections between congregations and the entrepreneurial spirit that fostered suburban growth. Marcus M. Brown reportedly visited and preached at the Fairmount (then Heights) Methodist Episcopal Church at the corner of Superior and Hampshire Roads in his Mayfield Heights allotment. Emil Preyer, a church member, sold Cleveland Heights Presbyterian Church the property for its first building at the end of Preyer Road, upon which he was then building homes. Patrick Calhoun, developer of the Euclid Heights allotment, donated the property at Edgehill Road and Euclid Heights Boulevard so that St. Alban Episcopal Church could be moved up the hill from Little Italy. Fr. John Mary Powers borrowed money from Bishop John P. Farrelly to buy the property for St. Ann Church and nearby properties on which the Meadowbrook Land Company could build new homes for St. Ann parishioners. In the post-World War II period, three congregations—certainly with the blessing of the developer—built churches in the Cleveland Heights portion of the Forest Hill allotment as it neared completion: Forest Hill Church, Presbyterian; Church of Christ of Forest Hill, and Hope Lutheran Church. 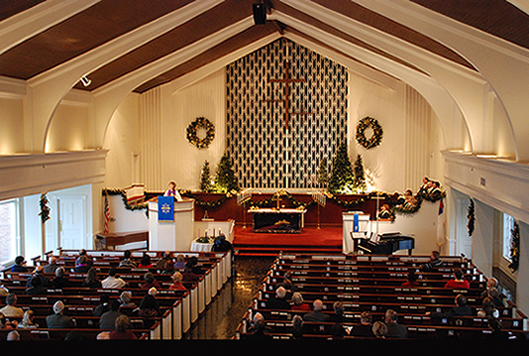 Cleveland Heights congregations have changed our landscape, adding beauty and architectural interest to our residential neighborhoods. Many early congregations first worshipped in humble surroundings. Until they had funds to build their own houses of worship, they met in private homes or shared public spaces. The oldest schoolhouses – Superior and Noble Road, and later Fairfax, Coventry, Oxford and Noble Schools—became temporary homes for religious congregations. Some met first in commercial spaces such as the Center Mayfield and Cedar Lee Theaters or the Van Sweringens’ real estate office. Cleveland Heights’ newest congregations continue this tradition, sharing worship spaces with other institutions or established congregations: Cleveland Heights Church meets at the India Community Church; Edgehill Community Church at St. Alban Episcopal Church; the Body of Christ Assembly Heights Church and Abundant Grace Church, at Park Synagogue. Disciples Christian Church and Pastor Kristine Eggert. As the suburb and the congregations prospered in the 1920s, they built more ambitious houses of worship. The former Heights Methodist Episcopal Church, having outgrown its building at Hampshire and Superior and re-christened Church of the Saviour, moved out of temporary quarters at Roosevelt Junior High into its stately Gothic cathedral on Lee Road; Fairmount Presbyterian replaced its modest wooden chapel with a gracious Tudor parish hall at Fairmount and Coventry. New congregations—Grace Lutheran Church, St. Paul’s Episcopal Church, and Trinity Congregational Church—built in the Gothic Revival style popular in the period. Jewish synagogues and temples were shaped by different architectural traditions. B’nai Jeshurun’s Temple on the Heights was Byzantine-inspired. 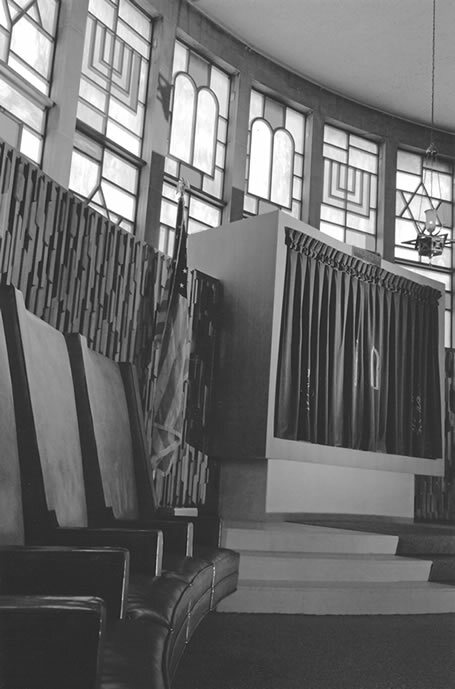 The distinguished designs of Park Synagogue, Oheb Zedek-Taylor Road Synagogue, Congregation Shomre Shabbos, and Congregation Kehillat Yaakov-Warrensville Center Synagogue were distinctively contemporary. 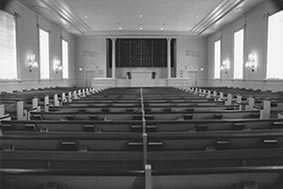 Amidst the growing ethnic and religious diversity of the post-war period, Protestant churches built or rebuilt in the American Colonial Revival style recalled the New England origins of the Western Reserve. Still handsome, gracious structures, older religious buildings have found new owners. Christ Our Redeemer A.M.E., New Community Bible Fellowship, the New Spirit Revival Center; Congregation Beth-El-the Heights Synagogue, Mount Olive Lutheran Church, Straightway Bible Fellowship and Greater Peace Missionary Baptist Church worship in buildings that first belonged to other congregations. Some former church buildings serve secular purposes. First English Lutheran Church has become elegant condominiums. Heights Presbyterian Church is the home of Heights Youth Club. Testimony to the religious pluralism of Cleveland Heights, houses of worship—from modest renovated storefronts to stately cathedrals—enliven our streets on days of worship and dignify them every day. Image below: Christ Our Redeemer A.M.E.
Cleveland Heights religious congregations educate the community’s children. Catholic congregations established St. Ann School in 1916 and St. Louis School in 1951; the Ursuline Sisters founded Beaumont School in 1942. Jewish congregations opened the Hebrew Academy in 1946 and Mosdos Ohr Hatorah in 1997. Lutherans established Lutheran East High School in 1960. Many churches also host preschools and day care programs. St. Paul’s Episcopal Church created Open Doors, an after-school program for middle school children that now operates at both St. Paul’s and Fairmount Presbyterian Church. Congregations serve adults by providing meeting places for support groups and classes of all kinds and gracious spaces for public concerts and lectures. The whole community is invited to attend the Journey to Bethlehem at Disciples Christian Church in December, the Strawberry Festival at Fairmount Presbyterian Church in June, and the Greek Festival at St. Constantine and Helen Greek Orthodox Cathedral in August. Perhaps the most dramatic change of the last century for congregations and for the community is that women now serve as pastors at Protestant and nondenominational churches. Women have constituted the majority of Protestant church members at least since the nineteenth century, and churches provided women with an early opportunity to play public roles. The Heights Methodist Episcopal and Noble Road Presbyterian Ladies Aid Societies and the Fairmount Presbyterian Women’s Aid Society, among others, raised the funds for church buildings and furnishings. Today, women pastors fill not only the pews and coffers but the pulpits in several congregations, including the Church of the Redeemer United Methodist, Disciples Christian Church, and the New Spirit Revival Center. Congregations arouse our civic consciences, urging us to change Cleveland Heights for the better. The St. Ann Audit in 1972 discovered racial steering and urged us to stand for racial tolerance and fair housing. The mission of the Home Repair Resource Center, established by Forest Hill Church, Presbyterian, in 1972 as the Forest Hill Housing Corporation, is to keep all Cleveland Heights homes “in good repair.” The Heights Emergency Food Center, located at Disciples Christian Church, feeds our neediest families. Cleveland Heights has continued to change, and so have its religious congregations. Just since Cleveland Heights Congregations went to the publisher in August 2008, the Start Right Church of God in Christ bought the Community of Living Hope United Methodist Church (originally Church of the Cross), and NewSong Church moved into the former Severance Athletic Club. In conclusion, I discovered the changes that religious congregations inspire, but I also discovered their enduring importance to Cleveland Heights – past, present, and future. The trustees of the Cleveland Heights Historical wish once again to thank Marian Morton for her support, and to remind readers that her newest book, Cleveland Heights Congregations, can be obtained at local bookstores and through Amazon.com.